i. These regulations may be called the Aadhaar (Enrolment and Update) (Second Amendment) Regulations, 2017 (No. 2 of 2017). ii. These shall come into force from the date of their publication in the Official Gazette. The Authority may require any Central or State department or agency which requires an individual to undergo authentication or furnish proof of possession of Aadhaar number as a condition for receipt of any subsidy, benefit, service or fulfilment of any obligation pursuant to any other Act or Rule or Regulation or order made thereunder, to ensure enrolment of such individual who is yet to be enrolled or update their Aadhaar details, by setting up enrolment centres at their premises." Regulations, 2016, the words “Scheduled banks” shall be substituted. 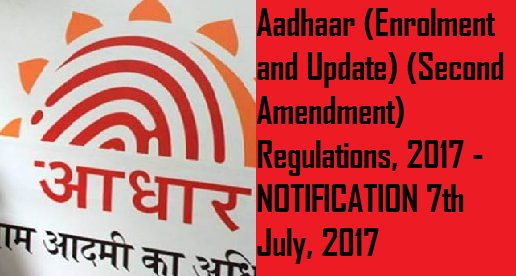 Aadhaar (Enrolment and Update) (Second Amendment) Regulations, 2017 - NOTIFICATION 7th July, 2017, Benefits and Services) Act, 2016, the Unique Identification Authority of India hereby makes the following regulations to further amend the Aadhaar (Enrolment and Update) Regulations, 2016 (No. 2 of 2016), namely.